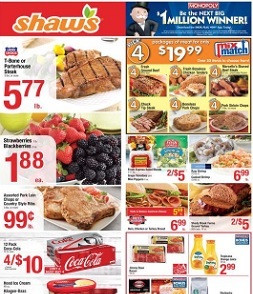 Latest savings from Shaws Weekly Flyer, valid April 19 – April 25, 2019: $5.77 USDA Choice T-Bone or Porterhouse Steak; $1.88 Strawberries 1 lb. Blackberries 6 oz. ; $.99 lb Assorted Pork Loin Chops or Country Style Ribs; 4/$10 Coca-Cola; 2/$5 Fresh Express Salad Blends; 2/$5 Shady Brook Farms Ground Turkey; $2.99 Tropicana Orange Juice; B1G1 free Jimmy Dean Bacon; B1G1 free Utz Potato Chips 9.5 oz. Doritos 9.25-10 oz. Tostitos 9-14 oz. ; 2/$4 Skippy Peanut Butter; $4.99 Newman’s Own or Freschetta Pizza; $12.99 lb Beef Tenderloin; $4.99 lb Boneless Chuck Roast or Steak; $3.99 lb Catelli Ground Meatloaf Mix or Ground Pork; $6.99 lb O organics Boneless Chicken Breast; $4.99 Aidells Chicken Sausage, Patties or Meatballs; 2/$6 Smithfield Breakfast Sausage Links; $10.99 lb Skinless Captain’s Cut Cod Loins; $9.99 lb Sockeye Salmon Fillets; $6 Lobster Tails; $2.49 lb Prince Edward Island Mussels; and more.